everything had to be put on hold. 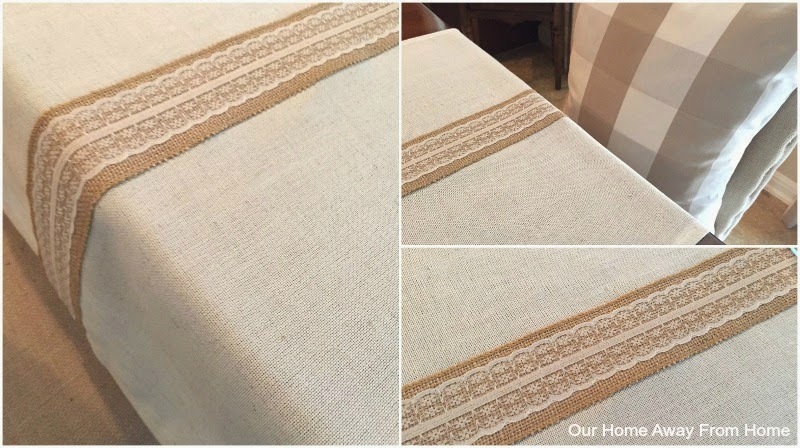 In the last few weeks, I have been sewing a bit at a time and it is finally all coming together. The first thing I did was take down the old drapes, remove old hardware, patch up and paint nail holes. The space was then ready to add my new drapes. 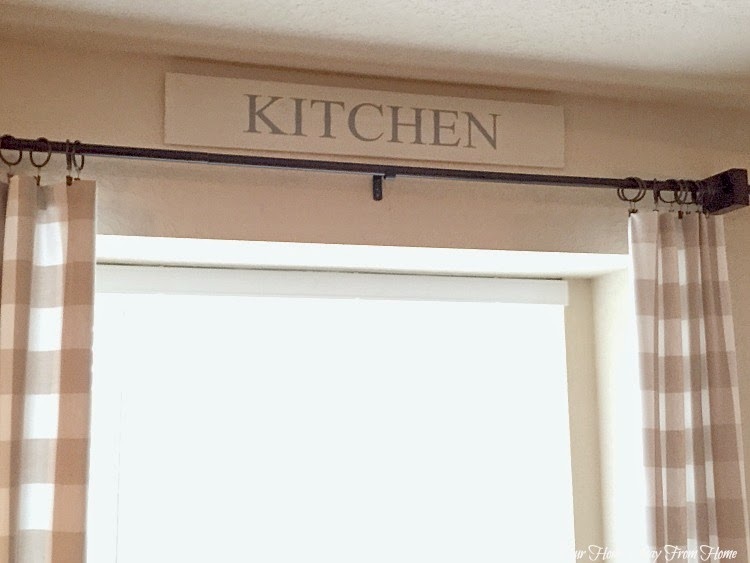 I also made a simple "kitchen" sign to go over the window. 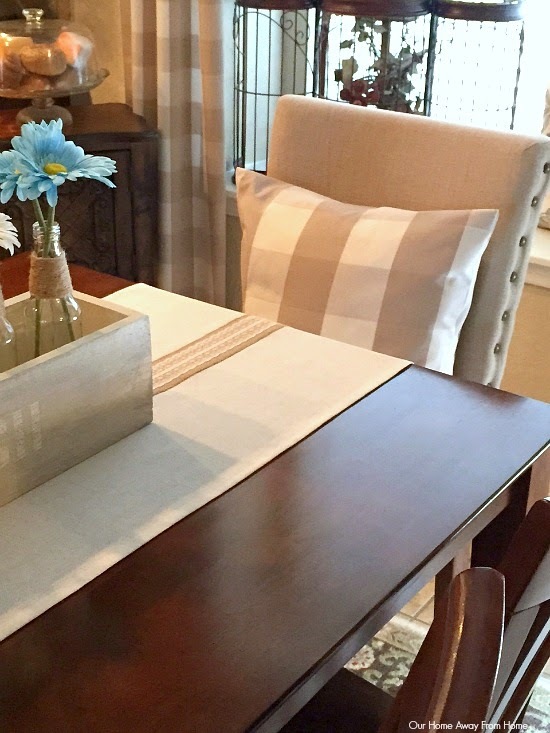 Next, I made new pillow covers for the chairs and window seat. 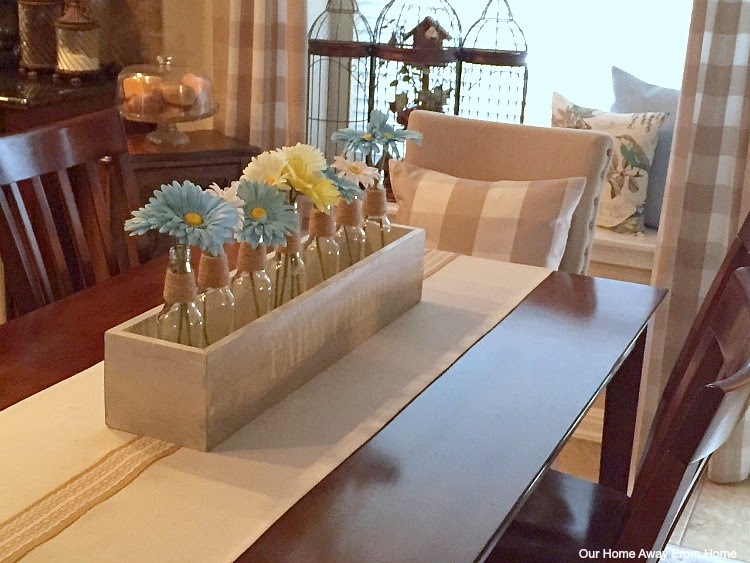 And I added as a centerpiece the glass bottle crate I made last week. I am sure I will make some changes as the Summer months get here, but for now, we are enjoying the Spring colors. Thank you all so much for your visit and for always taking the time to leave me such wonderful comments. 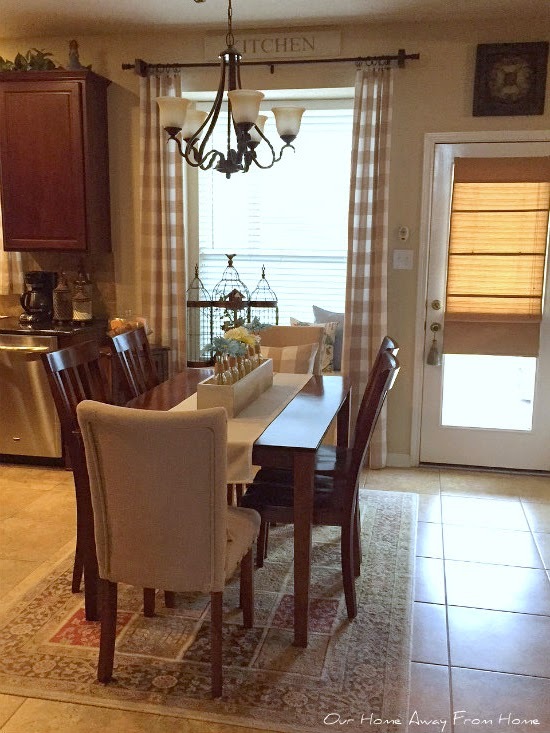 I will be back to share the rest of the kitchen and living area. 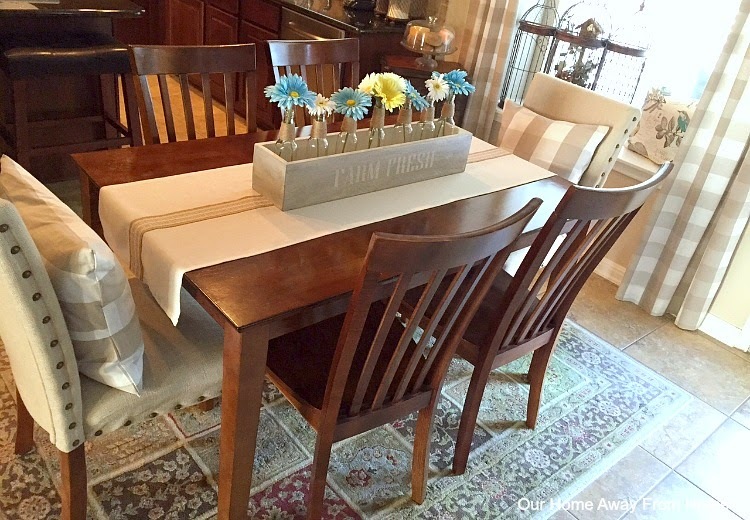 Love the new drapes and table vignette. Gorgeous. Lovely Maria. Spring time makes me want to change things up. 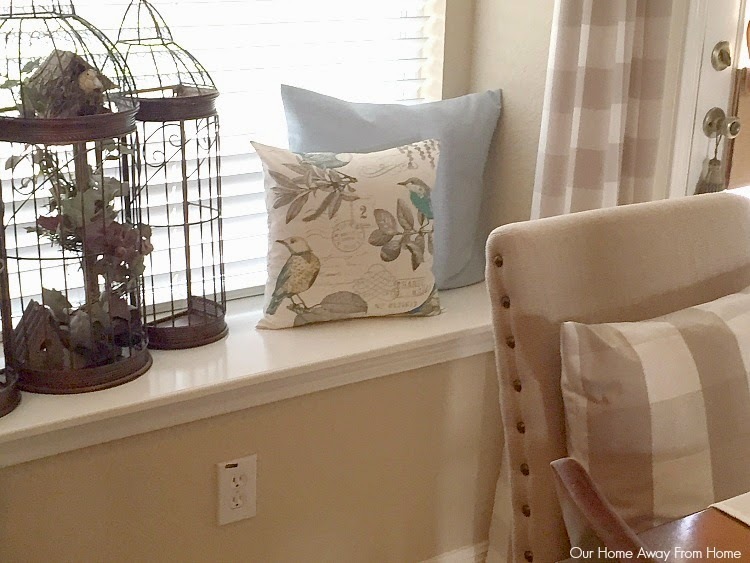 I love your table vignette but those bird cage and pillows by the window is darling! 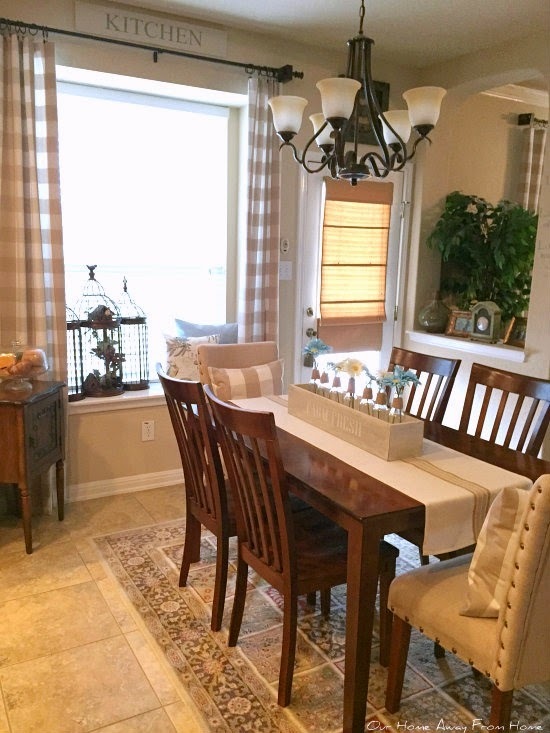 Loving your new curtains, pillows, and runner! What a pretty fresh look for spring. And your box of flowers is perfection. Maria E - wow this is such a pretty change - looks wonderful! 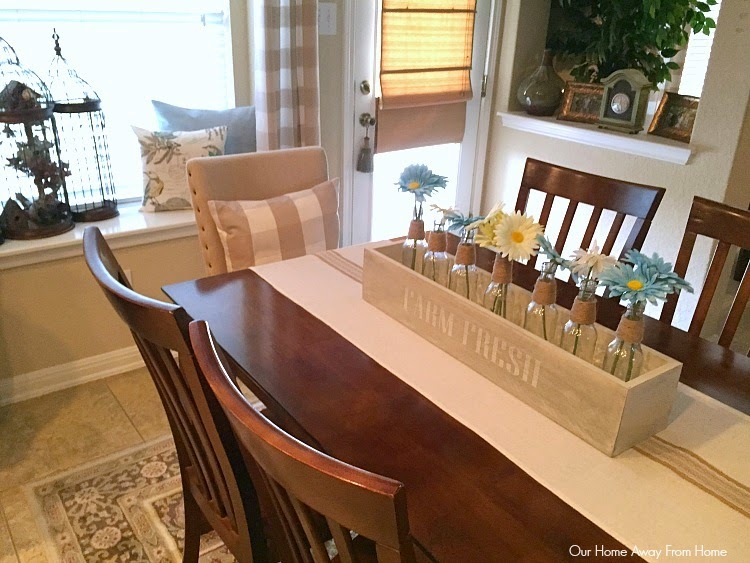 I love the sign, the pillows, the centerpiece, the runner...I guess I love the whole look of your kitchen! Fabulous! I love it all! The drapes are perfect and all your pillows add a nice touch. 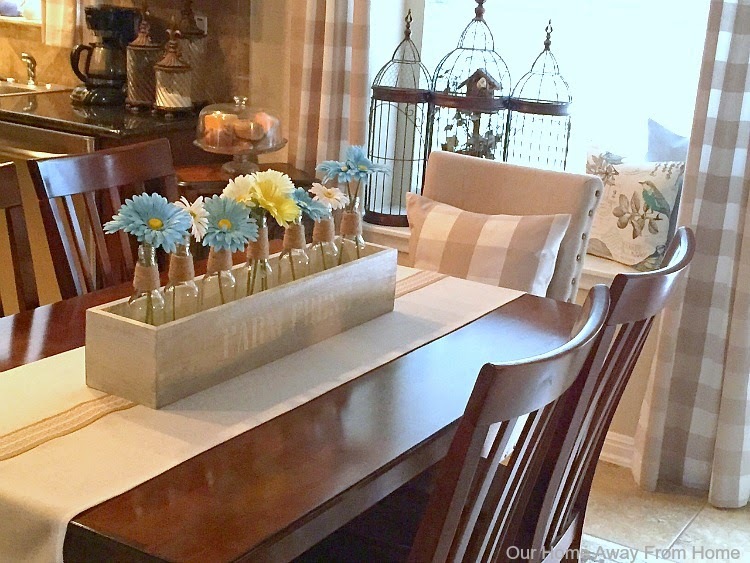 The centerpiece is so cute- I can't believe you have time to make all this! Very nice change...you did a wonderful job! Sentence after sentence you've written says "I made" in it - what talent! 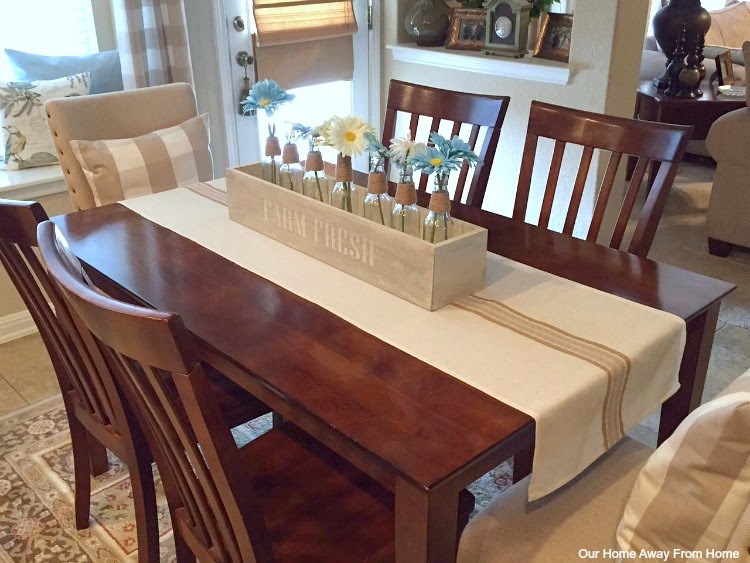 From all your sewing projects to the bottle crate centerpiece and the way you've put it together, it all looks terrific! 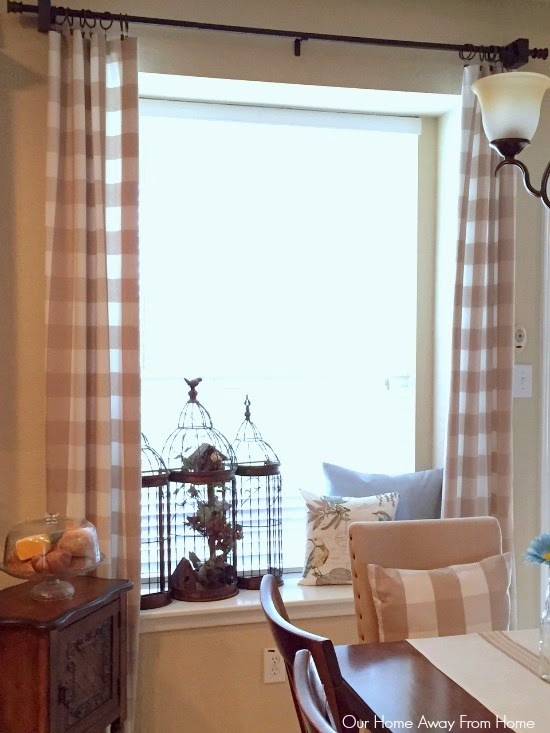 The drapes look awesome ... love the coordinating pillows, too! 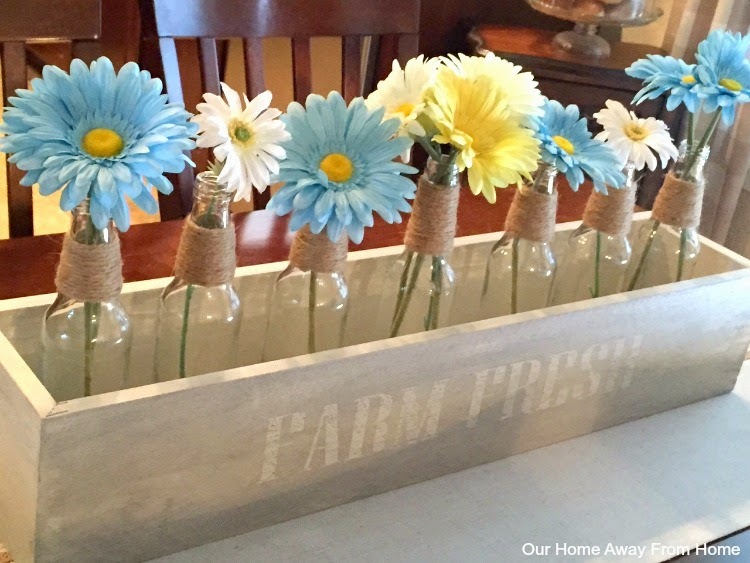 And, the centerpiece is beautiful (full of Spring)! May I ask where you found your cute bird pillow? 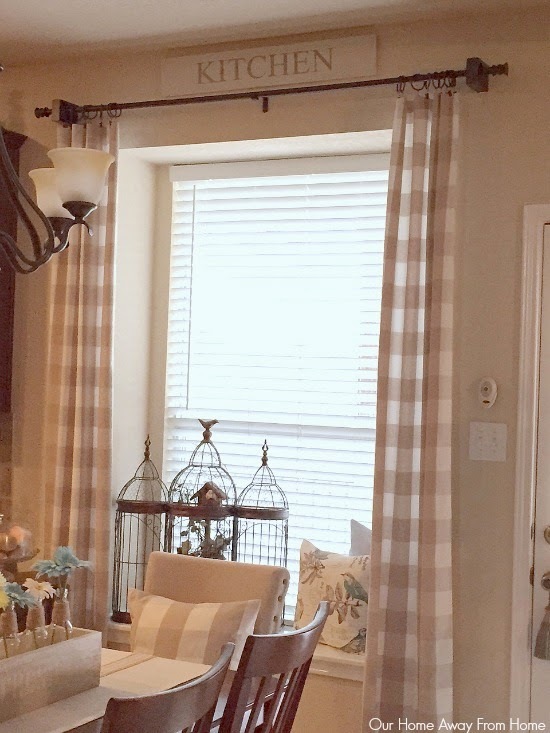 I love the addition of buffalo checks in your house! It ties everything in so nice! I'm thinking about using it in our new kitchen, as well since it's classic and so versatile! Everything looks so pretty, Maria! Your drapes are so pretty and the color so soft! 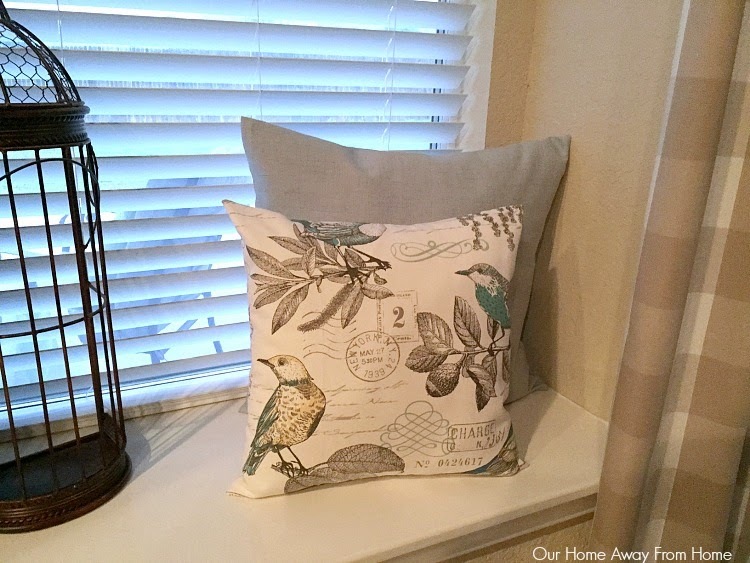 Love your deep window sill and your pretty pillows you've made too! 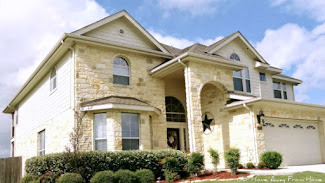 Your home always looks gorgeous! Happy spring!